As En, the protagonist, makes her way deeper and deeper into the maze of hallways and mirrors, the mysteries she faces are given satisfying and natural answers, but the answers bring with them more intriguing and enrapturing mysteries still. One of the most formidable foes for someone to face is theirself. The battle rages on intensely and indefinitely in their own head. Echo manages to stray from this path in the last way anyone would expect: fighting yourself hand-to-hand. Rather than making this happen by giving players boxing gloves and a mirror, the protagonist is dropped in the middle of an army of clones modeled after themselves. These enemies don’t simply look like the player; they learn from the player, behave like the player, and, for most intents and purposes, become the player. 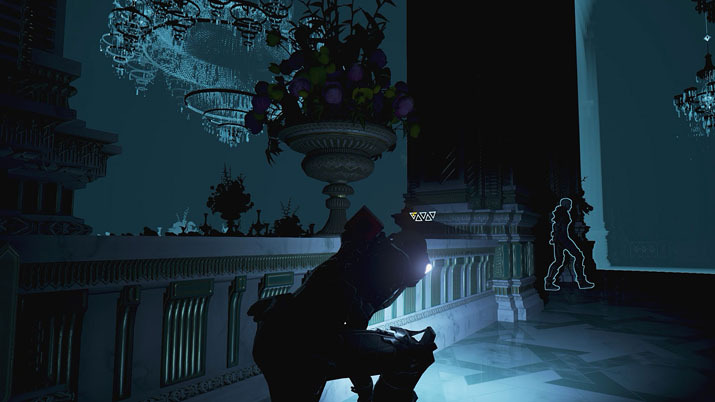 In this brilliant blend of puzzles and combat, Echo presents an AI that learns from player behavior in real time and adjusts, emulating their strategies more and more as the game goes on. Developer Ultra Ultra utilizes this unique mechanical concept as a vehicle for an equally fascinating story. Players follow the journey of En, a woman just waking up from a century of resting in stasis on a sentient ship named London, as she works to recover her recently-deceased grandfather. This goal brings her to a specific set of coordinates that he had left behind for her, leading to an underground palace on a desolate world. As she makes her way deeper and deeper into the maze of hallways and mirrors, the mysteries she faces are given satisfying and natural answers, but the answers bring with them more intriguing and enrapturing mysteries still. Frequent face-to-face encounters with familiar foes terrify players and only get worse as the title unfolds around them. From the onset, you can tell that you’re in for an entirely original and riveting time. The start menu itself is a fascinating concept, albeit fairly off-putting. The screen is taken up fully by one large eyeball, and you must use the cursor to move the eye, as the different options are hidden under the eyelid. From there, the game starts off hooking the player with its storyline, even if it is admittedly slow in terms of gameplay. The first ten minutes play out more as a cutscene on a treadmill, giving players busywork to tide themselves over during necessary exposition. Once this prologue is past, however, the real excitement begins. En finds herself in an elaborate palace that feels like an open-ended labyrinth. Rather than being lost in tight claustrophobic corners of an enclosed maze, players are lost in the much more terrifying concept of infinity, seeing corridors go on as far as the eye can see. As you progress through the palace and take varying actions, you notice faint, frosted imprints of yourself left behind, memories of your actions for the halls themselves to soak up. Frequent blackouts can feel as though gameplay is being halted periodically, but these gaps in time serve an important purpose, as it is during these that the AI learns from your behavior and adapts accordingly. Echo runs on some very innovative mechanics. In lieu of a HUD that could take up real estate on the screen and detract from players’ immersion, all the necessary information is given through an interface provided by En’s high tech jumpsuit. A 3D sphere is projected around her, showing the location and status of nearby enemies in any direction as well as an energy gauge that comes in very handy. Energy serves a very important purpose in this game and dictates much of what you are able to do. The first cell of power reserves refreshes itself over time, but all additional cells must be filled by stopping by stations found throughout the palace. Your reserves dictate whether you will be able to make descents of certain heights. Primarily, however, it’s all the ammunition you get. This is not a large inconvenience though, as the game isn’t inherently focused on shooting. For those who do wish to run through, weapons drawn, leaving a path of clone corpses in their wake, the developers have provided a very useful tool. If the pistol is drawn on an enemy for long enough, they will be marked with a red cursor that will persist even in the dark. This helps players to line up their shots for maximum success, as each can pass through and kill as many enemies as are willing to walk in a single file line. The suit itself holds a very powerful message in one of its key features. It judges your perceived intent, such as telling if you want to jump down a gap, and tells you whether or not you have the energy to accomplish this. Artificial intelligence reading your thoughts and intentions in such a benign way seems like nothing, but it lays the groundwork for the very premises that soon become your spitting image and your worst nightmare. This game delivers on graphics as well as it does everything else. The gorgeous backgrounds are rivaled only by the detailed faces that capture even the slightest microexpressions of En, bringing her to life in a whole new way. The faces of the echos met throughout the game evolve: at first featureless mannequins, but growing more and more lifelike as they learn, eventually becoming almost perfect clones. The settings in the game are undeniably as captivating as they are intricate. London’s interior, in particular, and the inner reaches of the temple are incredibly minutely detailed in spectacular ways. They never cross the line into being distractions, but the way that different pieces of the environment move, work, and even just look are thrilling and set a perfect tone. Not shying away from a deeper meaning, the developers went the extra mile of ensuring a detailed level of visual symmetry, matching the same equivalences between the player and their enemies. Echo proves that innovation can truly be limitless as long as there are people willing to push boundaries and explore new ideas. With a stunningly flawless trifecta of gameplay, storyline, and visuals, Ultra Ultra has knocked it out of the park with their first foray into indie gaming. Available on Steam and GOG, and coming soon to PS4, Echo is a must-have in any game library. Regardless of your tastes, styles, or interests, this adventure is sure to satisfy nearly all of your cravings. The only craving that you will be left with is for more and more game to play. Tom Grennell has been a writer for as long as he has been a gamer, which many would argue has been for too long. A fan of everything from gut-busting comedy to brain-bending puzzles to heart-stopping action to pants-wetting horror, Tom will eagerly devour anything he can get his hands on and get far too invested. He also runs the brand Target Retales, where he recaps daily strange and silly stories from his work as a cashier. For this he has received a moderate level of viral acclaim and has been written about by the likes of Refinery 29, Forbes, Business Insider, and more, although his crowning achievement to date remains a share and a shout-out of approval from George Takei.